Joy in the Journey: Independence Day - Are You Celebrating Yours? Independence Day - Are You Celebrating Yours? It's the 4th of July - Happy Independence Day to my fellow American readers! Today marks the day that we as a country boldly threw off the chains of tyranny and became our own nation. We declared ourselves separate, sovereign. The funny thing is: it was all done simply by writing it down. We celebrate the moment where a piece of parchment was accepted. We do not celebrate the moment a war was won; we celebrate, in essence, the moment it was begun. Let that sink in for just a moment. We celebrate a DECISION. A decision forever indelible in our country's history. Still, it was just a decision. Can we turn that inward? What decision has transformed your life? Is it something you can celebrate? Or is it something oppressive, something you would like to escape from? The best part about this holiday we celebrate? Before the year 1776, July 4 was just another day, just like the one before. The difference? Simply, the decision to change. You have the same opportunity, the same chance. Today. Today, you can decide to change. And the decision can be cause for celebration, for fireworks. Of course, the decision must be followed by a commitment to action and then subsequently with action. But if the decision is complete with a steadfast commitment, you WILL succeed. So will you take the chance? 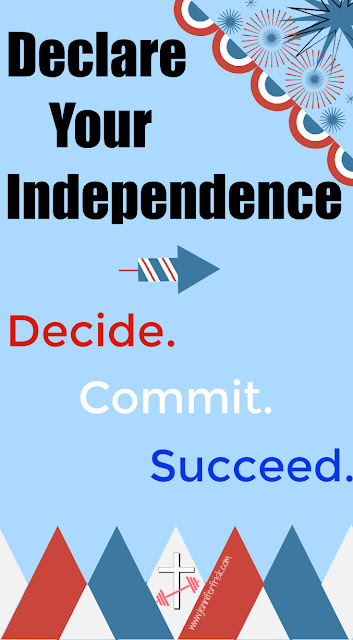 Will you make today YOUR Independence Day? If I can help in any way - especially in the realm of health and fitness - please feel free to contact me.